1. I was cleaning up the breakfast dishes this (Saturday) morning and Sam came into the kitchen and said, "You must come see this. You must." So I was happy to credit him with me not finishing cleaning the kitchen. Do you see number 8? Well, some folks balked at that.... that Baylor would be placed so high.... since we've not played any big games. Ah, but the games we've played have been PLAYED WELL. And Clay has placed us number 8!!! Sam and I are glad for that. Here's number 2 - of the things I've learned in Sept.
2. A favorite person of mine... has had a major upset in his life. 4. 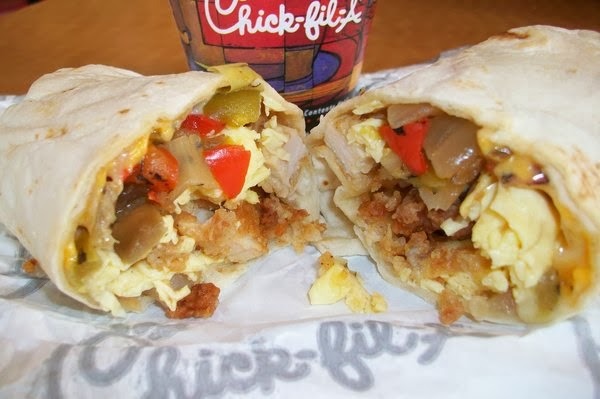 I had the breakfast burrito with chicken from Chick-Fil-A- this week. I don't think it was as good as Le Peep's omelets, but it WAS yummy. 5. Sam (my husband) got certified in the Myers Briggs Type Indicator this past week. I think it is so important that people know about themselves. 6. So life IS interesting: Never a dull moment. I'm thinking that at 61 years old - life NEVER gets dull. So those are some things I've learned (and thought about) in September. Sad about La Peep, one of my California friends swore up and down by them, but I never made it over there! We did the Myers Briggs as part of our per-martial counseling, and yep, it sure was informative! How cool that Sam is certified in it! Me, me, me!! I will come to the reunion representin' Class of 71! My daugher, SIL and little Charlie live in Prosper, so it would be so wonderful. Please keep me on your invitee list! Bet I could help you with some other Class of 71'ers! BTW, your blogs are so wonderful. I always think of sweet Peggy and know that she is looking down so pleased that you have "adopted" her precious children and grandchildren. God bless. I need to get with it - and start planning it, and inviting, etc.--- before I lose my nerve! We're all on the same continent now!